I have several apps in my iPhone for my younger brother to play. He has his own iPhone now, so I want to delete those unwanted apps from my iPhone. Is there any quick way to delete them? I’ll appreciate all of your suggestions, thanks in advance! We all hate having unwanted app icons on our iPhone screens. More seriously, unwanted apps take up storage space on our iPhone that we may need for other apps and media files. Don’t worry. There are four equally effective methods to remove apps from your phone. You can pick whichever method you are comfortable with. It is the easiest and quickest way to delete apps from iPhone directly. All you need to do is go to the main screen. 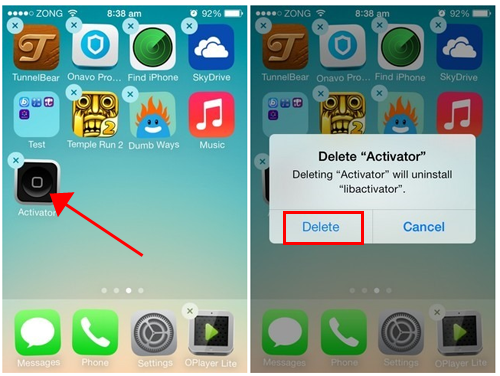 If you have saved a lot of apps in your iPhone, and want to delete them, you can directly delete them on your iPhone. The steps below will show you how to delete apps from iPhone directly. 1. You only need to keep touching the icon of the app until it wiggles with an X at the upper left corner. 2. Then tap the X and choose “Delete” in the pop-up dialog. You will get the apps deleted with no efforts. To delete an app, tap the X, then tap Delete in the dialog the displays. Note that doing so deletes not only the app, but also all of its data. So if you think you’ll need an app again soon, and you have stored data, settings or completed levels for it, you might want to think twice before tapping that X. Sometimes you cannot see the X and don’t know how to delete apps from iPhone directly, you can check the Settings at this moment. Then you can try to delete the apps on your iPhone again. 1. Check the “Settings”, then scroll down a bit and tap on the “General” option. 2. 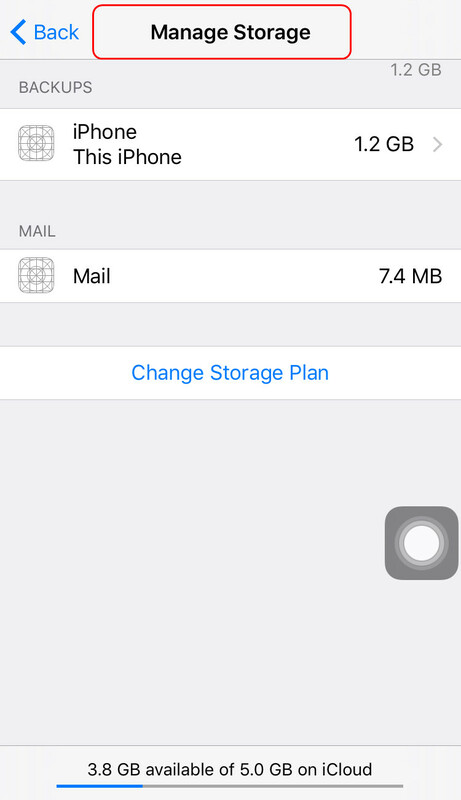 Tap on “Usage” (older version of iOS) or tap on the “Storage & iCloud Usage” (newer version of iOS). 3. 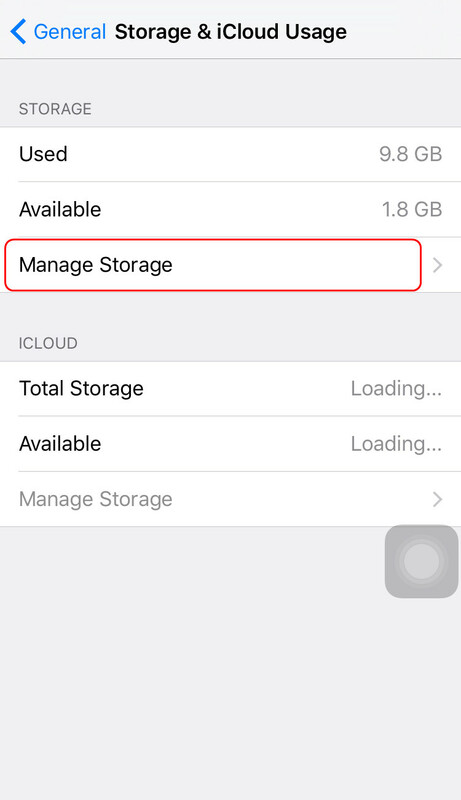 You need to tap on “Manage Storage” and you’ll see a list of all app installed on your iPhone. Simply select the app and tap on “Delete” to delete that app. But some users thinks deleting apps on iPhone one by one is a waste of time, and in some situations, we will still get them back when we sync with the iTunes even after the apps have been deleted on iPhone. Therefore, if you want to delete apps from iPhone in batch, and meanwhile delete the apps in iTunes, you will want to try this iPhone manager software – Leawo iTransfer. Leawo iTransfer is used for transferring files among iOS devices, iTunes and PCs, and it helps users manage the files in their iOS devices with ease. 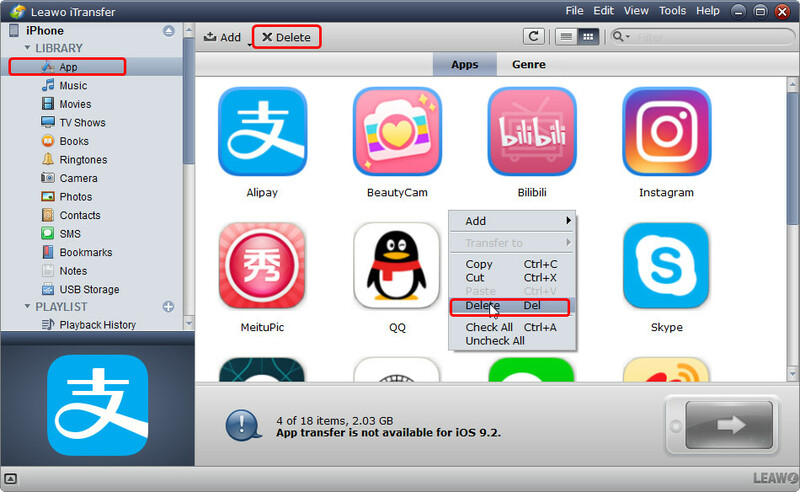 The following guidance will show you how to delete apps from iPhone in batch, and you can free download this software to have a try. Note that the trial version has limited transfer times. 1. Run Leawo iTransfer after installing it, and connect iPhone to computer with the USB cable. 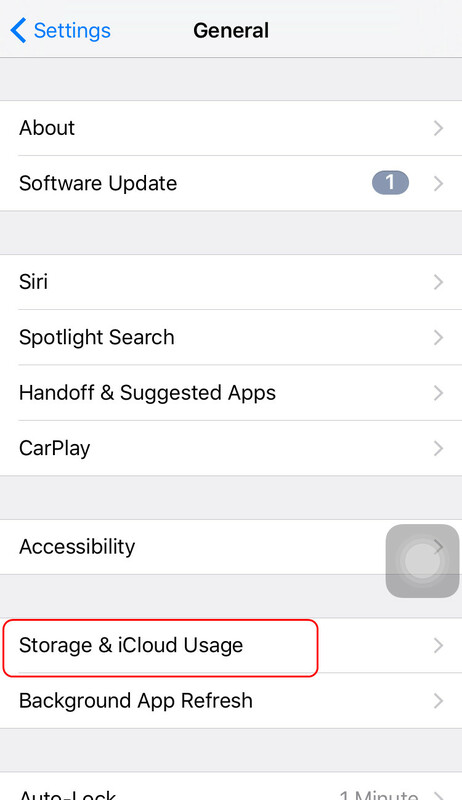 The software will recognize the iPhone and automatically detect the libraries of the iPhone, and show the libraries in the left sidebar. Choose “Apps” library and then the contents will be shown in the right part of the window. 2. Hold “Ctrl” key and click to choose the files you want to delete, and then right-click the selected apps and choose “Delete” in the option menu. Then the software will start deleting apps on iPhone, and it will finish the deleting process in very short time. The software will also help you delete the apps in the iTunes library. You also need to connect your iPhone to computer first and then you will find the iTunes library is below the libraries of your iPhone. Choose the “Apps” library and select the apps you want to delete and click “Delete” in the option menu. Then the software will also delete the apps in your iTunes library as well. 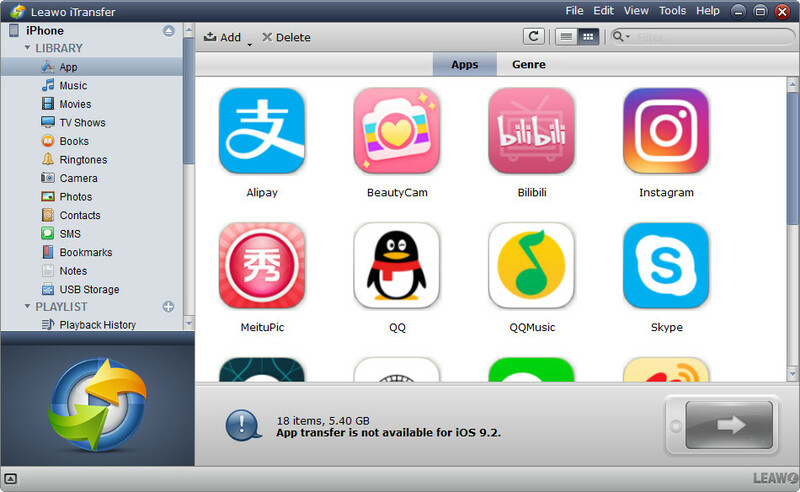 Leawo iTransfer enables users to backup iPhone, iPad and iPod touch files to computer, and it helps users to backup iPhone apps to computer in IPA files so that the users can easily reinstall the apps into their iPhone with no efforts. You can check out the following guidance about how to backup iPhone apps to computer. When you delete apps from your iOS device, iTunes will not copy them back on to your device the next time you sync it. So the above techniques are great if you want to delete apps from specific devices but still retain them in your iTunes library. 1. Go to iTunes and choose your Apps library. Click an app to select it, then press the Delete key. 2. Another dialogue will ask you if you want to keep the app or move it to the trash. 3. Ted Landau recently posted a tip discussing why that can be useful. 4. You can delete iPhone apps from iTunes library, but keep them in a folder on your Mac just in case.